The Tides Marine Track and Slide System is a high performance, low-friction mainsail luff track and slide system built to handle the increased loads and demands of today's full-batten mainsails. 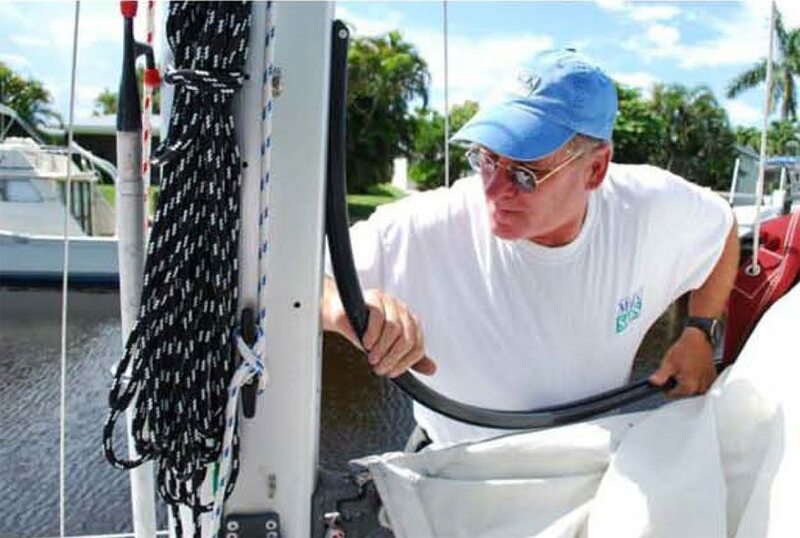 When installed, the mainsail will rise easily and drop the instant the halyard is released. The System consists of a one-piece UHMW track and an "owner-defined" selection of matched slides and batten receptacles designed for smooth, long-lasting operation. The Sailtrack is priced per foot, which includes all hardware. It offers minimal stack height, less weight aloft and low-friction performance rivaling systems costing more than twice as much. It can be installed without going aloft and without drilling holes in the mast. Hi Dave, I've finally got my mast back in the boat and have had a couple of runs with the new sail and track - both are excellent and I just wish I had ordered the track system years ago. Hi David We just picked up our copy of the Afloat magazine and saw the ad for your great track system . Hope this form of advertising works for you ,we are delighted with our sail track and show it to anyone who is interested. We are regularly in touch with Shaun and John now in Alaska who you helped with their Strong Track system when they were passing through Aus and they have had their system for 7 or 8 years I believe and are happy with it. Carol at Port Townsend Sails in Washington State, USA was the first one to tell us of about the Strong Track system when we were over there in 2007 but at that time we were strapped for cash so didn't proceed. Glad we have now. I do think you need to publicise the system more in Aus as not too many people seem to have heard of it. We will be promoting it in our club, CCCA in Sydney. A couple of months ago we fitted a Tides Marine Sail Track to our 40 foot cutter "Dreamtime III". For 16 years we'd been spraying lubricant onto the slides or just struggled to haul and drop the main...but those days are over. We've nick named our sail track "the slippery little sucker"! The only resistance I experience now is the weight of the sail or the attitude of the crew :-) Thanks Dave, great innovation!